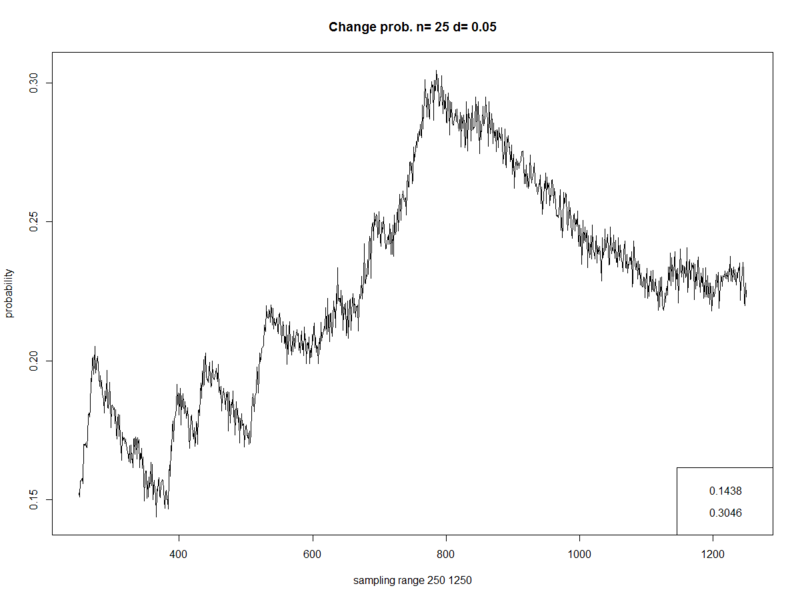 M10 is a small boutique developing algorithmic trading strategies. The company debuted on the NewConnect exchange in Warsaw on February 6th this year. 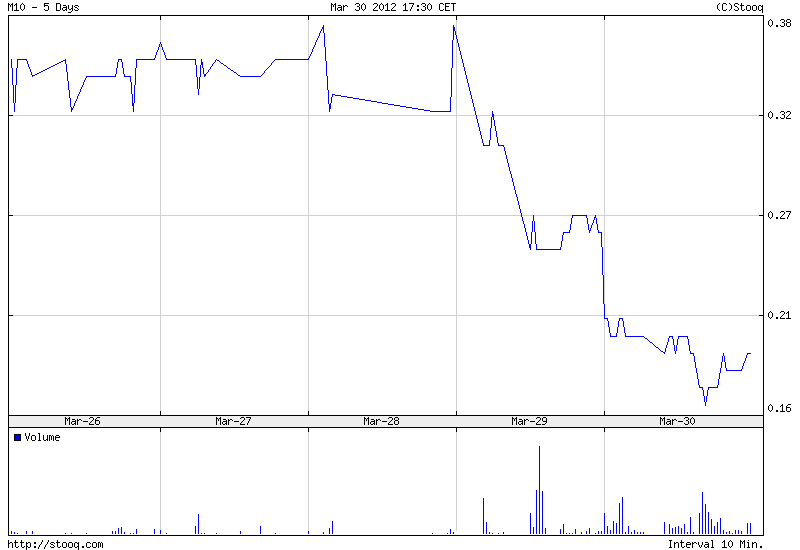 The offered price was 0.10 PLN, and it closed at 0.15 or +50% up on the first day of trading. Since then, its price has risen to 0.38 or +380% in relation to the IPO price. Just today, without apparent reason it went down by nearly -27% to 0.19. As a result, the price is still +90% above its initial level. But where it will go from here? I'm quite surprised that two option pricers, ostensibly using identical closed end solving mechanisms, sometimes give different results. One may say that the difference of 134.69 is not much for the option valued some 72.000 (134.69 / 71863.77 = 1.8742e-3). It's probably true. So, which value is correct? The red elements dominate over the green, the green over the blue, the blue over the unlayered rest. Pareto set contains elements dominating over others. From the optimization perspective, they contain elements that should be considered equal. 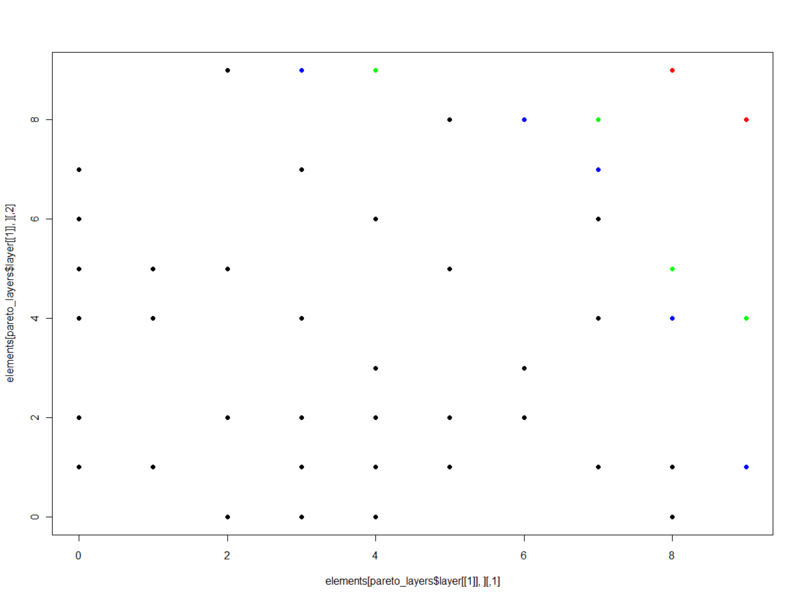 Often it is possible to establish layers of Pareto sets subordinate to the higher order sets. Pareto sets and layers are interesting way of selecting elements characterized by multiple criteria. 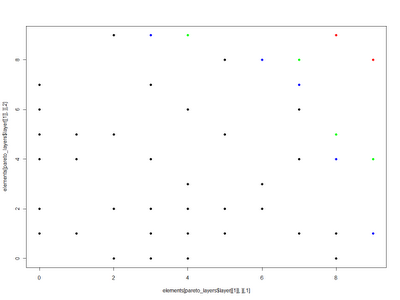 One of the other methods is convolution. What is the probability that the market will raise 5% over 25 sessions? 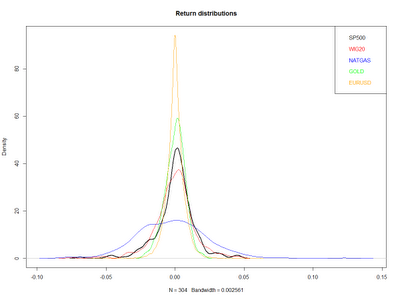 A couple of days ago I wrote a post about differences in return characteristics of various assets. Now I'd like to take a look on the markets from a little different perspective. 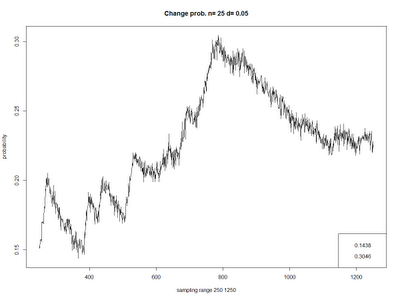 What is the probability that the market will raise at least x% over the next n sessions? 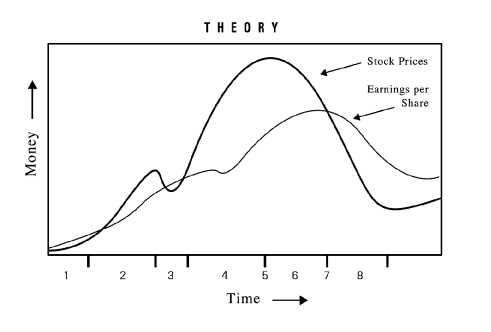 The so called "modern portfolio theory" takes expected return of assets constituting the portfolio as one of its three critical parameters (the others are asset correlations and their volatility). Hence, the people constructing portfolios based on this theory must somehow guess what these parameters will look like in the future. Hence, I decided to explore the first of these parameters - the expected return - and asked the above mentioned question. On the chart above you can see the probability of a 5% growth of the WIG20 index of the Polish stock exchange over 25 sessions (a month), calculated on the basis of the 25-days samples drawn from the previous 250 to 1250 sessions (1 year - 5 years). 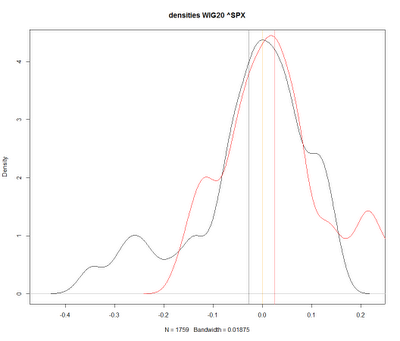 As you can see, the probability fluctuates between 14.38% and 30.46%. OK, and how it looks from the opposite side, i.e. what is the probability of a 5% decline? 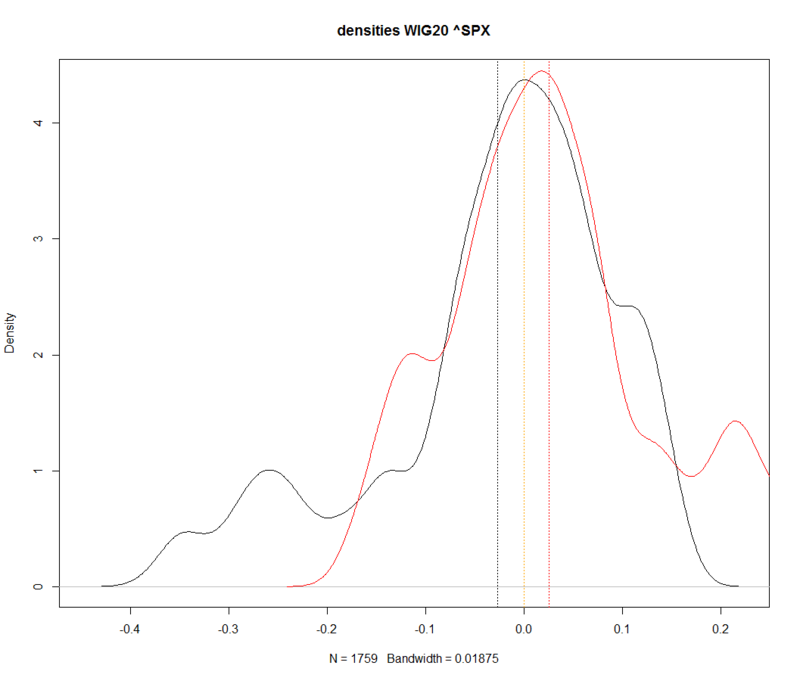 The probability range is pretty similar: 14.24% - 30.68%. 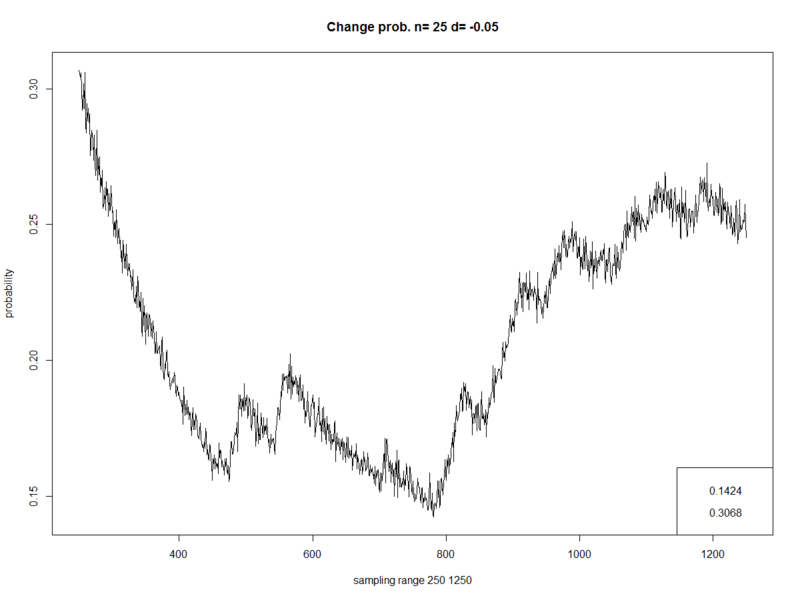 Even if the overall probability of a +/- x% change seems similar, the specific realization can vary greatly depending on the particular moment in time. 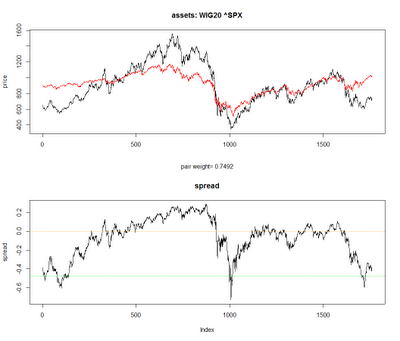 A couple of days ago I mentioned a visible decoupling of WIG20 and S&P500 indexes. I noted that most probably it would lead to a contraction of the distance between the indexes by a larger correction in S&P500 than should be expected in the WIG20 case. Here we have another reinforcement of this hypothesis. 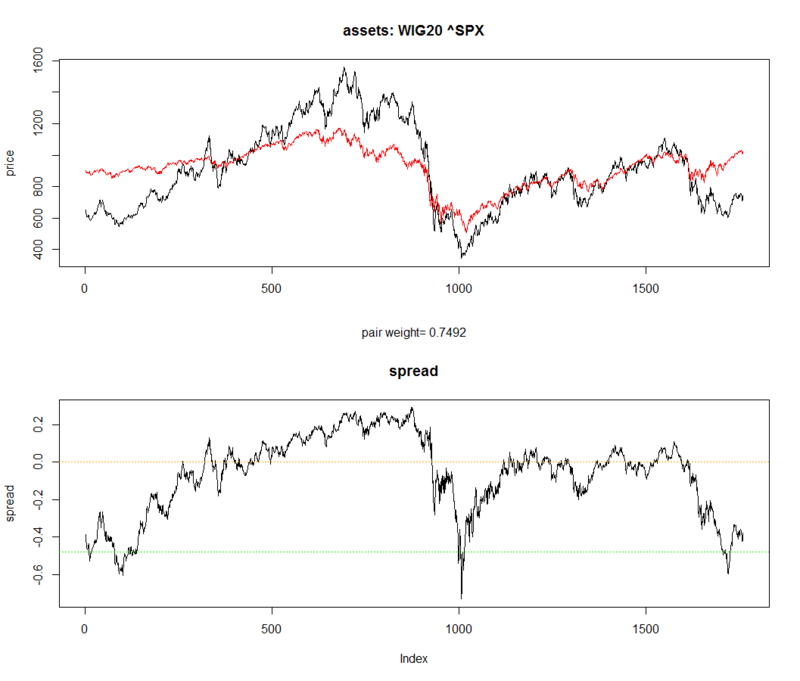 The chart above shows the co-integrated trajectories of the indexes as well as their spread since 2005. As you can see we are clearly in the lower range of the possible spread values, and at the two standards deviations away from the mean spread. This is quite an unusual situation. 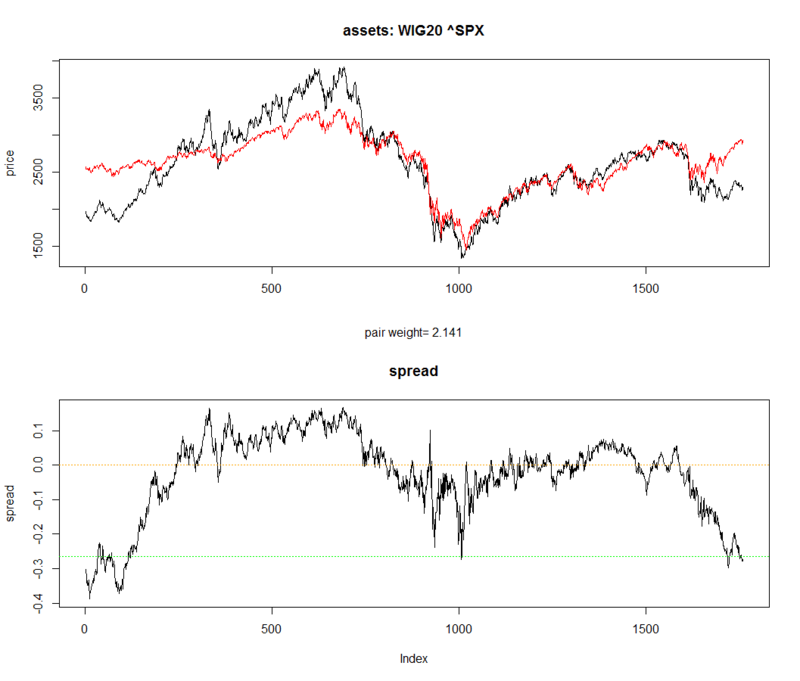 The history suggests that the spread can widen by some additional 10-15 pct. points in really extreme situations before it starts to contract, although such development seems currently unlikely. The increasing number of financial markets participants start to understand that applying models based on normal distribution can be disastrous to their investment performance. 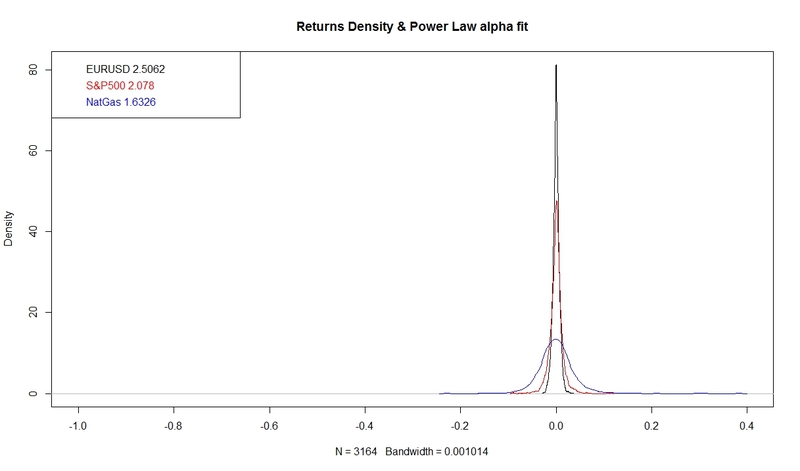 Pareto distribution based on the Power Law may be a better alternative. 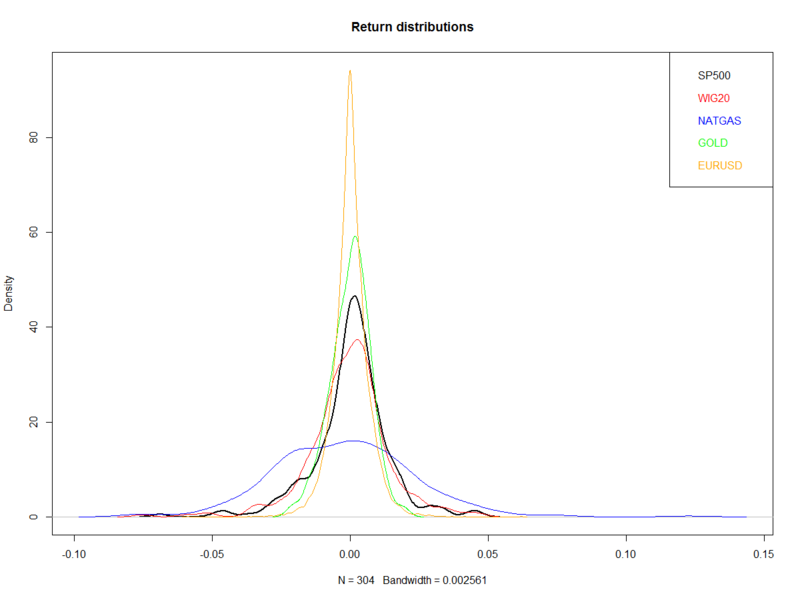 Still, various financial assets may follow Pareto distributions with different parameters, especially different alpha exponents. 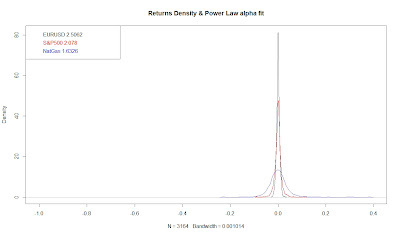 Above you can see a chart of probability densities of daily returns for three assets: EURUSD, S&P500 index and natural gas, together with the alpha exponents fitted to them. 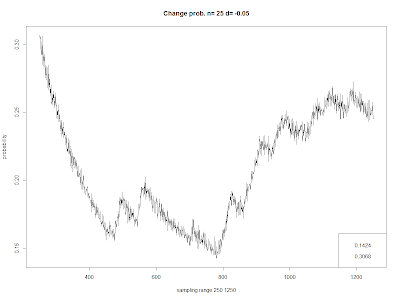 In the initial stage (1) the trend is not yet recognized. 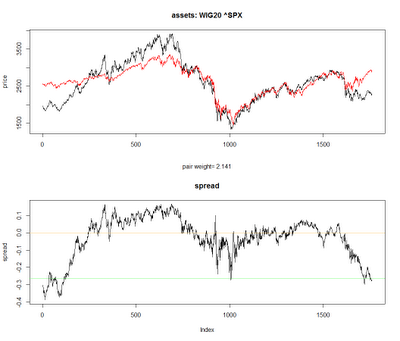 Then comes the period of acceleration (2), when the trend is recognized and reinforced by the prevailing bias. That is when the process approaches the far-from-equilibrium territory. A period of testing (3) may intervene when prices suffer a setback. If the bias and trend survive the testing, both emerge stronger than ever, and far-from-equilibrium conditions, in which the normal rules no longer apply, become firmly established (4). Eventually there comes a moment of truth (5), when reality can no longer sustain the exagerated expectations, followed by a twilight period (6), when people continue to play the game although they no longer believe in it. Eventually a crossover point (7) is reached, when the trend turns down and the bias is reversed, which leads to catastrophic downward acceleration (8), commonly known as the crash. 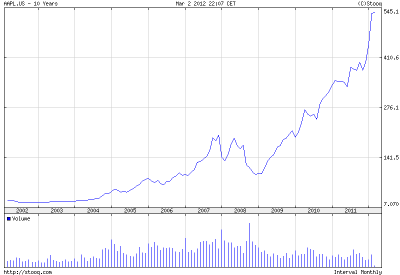 Chart: Apple stock price, 10 years. It seems that the growing trend in Apple shares was successfully tested at the turn of 2008 and 2009, and accelerated significantly according to the model, to enter the current far-from-equilibrium territory. 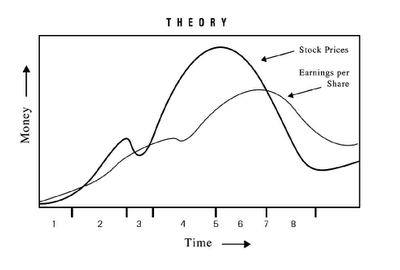 As the boom bust model suggests, the inflection point is reached when earnings per share are still growing. On January 24th, Apple presented stupendous Q1 2012 financial results. The company also issued extremely positive Q2 2012 earning guidance. 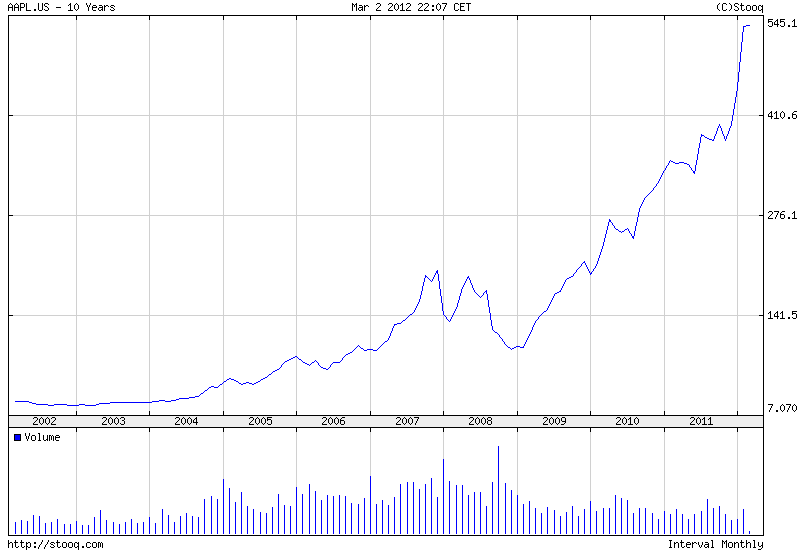 Just recently, Apple market capitalization has exceeded $500 billion. On March 7th, Apple is going to present its new tablet - iPad 3 / iPad HD, and possibly some other products. There are no limits to Apple growth, right? I'm currently betting the opposite. I'm fully aware that the Soros' model may be wrong or inadequate for the Apple's situation. I also realize that prices in the far-from-equilibrium area do not follow any strict rules. Hence, there is a high risk in going against the prevailing bias. The Apple share prices can still go significantly higher. As John Maynard Keynes said "markets can stay irrational longer than you can stay solvent". But they simply cannot go up forever. The Eurozone collapse scenario fund Eurogeddon started just a week ago. Today we get the first real weekly performance reading for it. And it doesn't look very good. Over the recent week the fund went down by -4.01%. Don't get confused by the reported overall result of +29.30%. It is just a residue resulting from the creation of the Eurogeddon on the basis of the previous long biased fund called Universa-plus, which was +34.70% at the moment it was transformed into Eurogeddon. A single data point is definitely too little to judge the project, but it gives a hint of variability you may expect from the fund.